Feminism is under fire. Feminist philosophy has reigned—the queen unchallenged—since the end of the early 1980s. But in recent years, biologists, educators, law enforcement officials and thinking women have begun objecting to and rejecting some long-held feminist doctrines. The throne’s foundation has cracks! Many of the radical feminist’s sacred truths are now recognized for what they are: myths and lies. Although there exists some strong opposition against the feminist fortress, we should not expect the feminist movement to topple any time soon. But is there truth in the criticism? Has the feminist movement, so proudly praised for servicing women, done a disservice to the family? Feminists claim the women’s suffrage movement as the beginning of modern feminism. The suffrage movement originated in the United States during the 19th century. Some famous early suffragists were Susan B. Anthony, Elizabeth Cady Stanton and Lucy Stone. Originally, women’s suffrage sought to give women equal political rights with men—the right to vote in elections and referendums; the right to hold political office. We must remember that these political rights had only been given to the majority of the male population as a result of the democratic revolutions of the 18th and 19th centuries. The women’s suffrage movement claimed its victory shortly after World War i with the ratification of the 19th Amendment to the Constitution on Aug. 18, 1920, guaranteeing women the right to vote in state and federal elections. 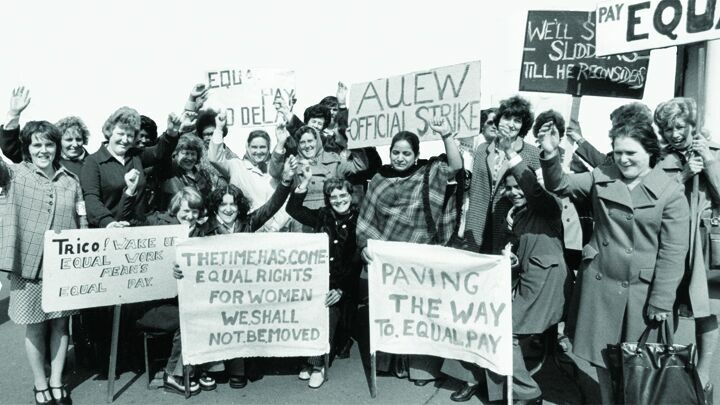 In the 1960s, the women’s liberation movement was organized and became active. Betty Friedan is credited as one of the founders of modern feminism. Her 1963 book The Feminine Mystique challenged the traditional idea that women could find fulfillment only as wives and mothers. She taught that the idealization of the role of wife and mother was the product of a well-organized conspiracy by males to prevent women from competing with men. In 1966, Friedan founded the National Organization for Women (now) to fight for equal rights for women, and served as its president until 1970. At that time, the women’s movement sought to liberate women from the tedious humdrum of babies, bottles, diapers, cleaning and cooking. Women’s movement leaders sought freedom from their “prison” at home. The key to freedom was equal opportunity with men, which meant equal jobs and equal pay. Then, the women’s movement aligned itself with the civil rights movement. A clear message was being sent: Blacks had to fight white racism; enslaved women had to fight male sexism. Women everywhere had to be made aware of their oppression and oppressors. The women’s movement borrowed heavily from the attention-getting strategies of the civil rights movement. It skillfully employed rallies, demonstrations and marches to trumpet the women’s cause. Besides politicians and media, the struggle targeted young, impressionable college-aged women. What began as a tiny rumble soon roared into major discontent. Many angry, frustrated women joined the cause. The energy released by the women’s liberation movement was enormous. Old traditions came tumbling down. Now we have four decades of feminist history to look at. What do we see? More than any other social movement in our time, feminism has changed the warp and weave of our society. Feminist philosophy has made major inroads into politics, the work place, the military, education, medical research and the building block of society—the family. Very few have questioned the changes. Many who balk at some feminist notions heartily embrace others. Wisdom tells us not all change is good. Not all change is growth. Some bitter fruits are now being harvested from feminism in all areas it has infiltrated, in the personal lives of many women, and especially in the family. Who will take the blame? For decades, feminists have condemned men for everything. Supposedly, our patriarchal society is the root cause of everything wrong. Of course, some men should be condemned for their mistreatment of women. But what has feminism brought us? Is life really better for women? Are families better off? Is society stronger? The fact that so many women identified with the liberation movement shows that there were real problems within the American home. The movement greatly publicized the dissatisfaction and desperation of housewives. Many American wives were indeed unhappy. But what was the cause of all the unhappiness? Leaders of the women’s liberation movement theorized that the real cause of women’s sorrow was the role of wife and mother. Many asked, shouldn’t we women find fulfillment in a career like a man? Supposedly, those who wanted to hold a career had been made to feel guilty about it by oppressive males. Many women began to feel their real potential was being denied them. The proposed solution was that women seek real fulfillment outside of the home—without guilt. Women fought hard for the right to choose a career outside the home. Yet labor statistics at that time show that a large number of women had already entered the work force. Could the cause of unhappiness have been wrongly identified? Was a wrong solution given? Caught up in the movement, few seemed to ask these all-important questions in the ’60s and ’70s. Today, many women have come to understand that feminism really did not offer a choice in the ’60s. In fact, it demanded that women could only find fulfillment through a career outside the home. Though it has taken several decades for it to be recognized, in reality, feminism has led a vicious attack on motherhood—one of two major underpinnings of strong families. The ’60s woman complained that she was made to feel guilty for not desiring to stay home. Isn’t it ironic today that a woman who desires to stay home to be a wife and mother is made to feel guilty? In an interview on abc’s Good Morning America, prominent feminist Linda Hirshman said, “I am saying an educated, competent adult’s place is in the office” (February 23). Feminist Rebecca Traister admits that, somewhere along the line, the feminist movement declared stay-at-home mothers uneducated and incompetent: “[W]hen you lose your paycheck and lose your title, somehow you lose respect. And … that should not be the case” (Salon.com, Dec. 6, 2005). Young women are made to feel that education should be directed toward career advancement only and not toward teaching and training their own young children. Stable families with educated, stay-at-home mothers would solve a large number of our current social troubles. We must learn to defend and praise the women who stay at home. Motherhood is noble and fulfilling, real work! Today, a stay-at-home mother is viewed as a kind of second-class woman. In fact, feminists do not even view stay-at-home mothers as persons. This derogatory view began with Betty Friedan. “[V]acuuming the living room floor—with or without makeup—is not work that takes enough thought or energy to challenge any woman’s full capacity. Down through the ages man has known that he was set apart from other animals by his mind’s power to have an idea, a vision, and shape the future to it. … [W]hen he discovers and creates and shapes a future different from his past, he is a man, a human being” (The Feminine Mystique). The basic idea of feminism was that women should have a choice to go to the workplace and become less animal-like. What does that make a stay-at-home mother? Since being a wife and mother was supposedly glorified in the 1950s, the women’s movement fought to demote that role to the lowest level possible. Many impressionable young women wholeheartedly believed this 1960s philosophy. Unfortunately, this feminist teaching has planted deep roots in the consciousness of American women. The feminist tree has blossomed. Today, it is considered a great shame to be a wife and mother only. In fact, being a wife and mother is synonymous with the meaningless life of a lower, uneducated class of people. What are today’s fruits of this philosophy? The fight for women’s rights has actually turned into a fight against the family. Even the mothers of modern feminism admit that radical feminists have worked hard to repudiate the family. Feminist Stephanie Coontz, history professor at the Evergreen State College in Olympia, Wa., wrote in the Washington Post, “We cannot afford to construct our social policies, our advice to our own children and even our own emotional expectations around the illusion that all commitments, sexual activities and caregiving will take place in a traditional marriage” (May 1). You don’t have to read between the lines to understand that such thinking is destroying the traditional family! It is within the Anglo-American world that feminism has been embraced the most passionately. These countries also have the highest divorce rates in the world, and are producing record numbers of fatherless children—which in turn creates many other social problems. Robert Sheaffer writes, “One can try to argue that the U.S. family died of natural causes at precisely the same time feminists began shooting at it, but after examining the depth and ferocity of the feminist attack against women’s roles as wives and mothers, such an argument fails to convince” (Feminism, the Noble Lie). Let’s own up to it: Feminism has caused some tragic results for the family. If we are going to fix our social problems, we must recognize that feminism has led our Western families into serious crises. Here is how it happened. Although many young women answered the call to pursue a career, they could not deny their natural desire for a husband and children. Many then opted to have a husband, children and a career. Realizing that certain feminine desires could not be denied, a new movement slogan was quickly pushed into public view—“having it all.” This slogan lives on. But it ignores a hard reality for many working mothers: Having it all also means handling it all. Working career mothers were forced into a high-stress rat race. Having it all was supposed to be fulfilling, but it was not. Now, almost four decades later, women find they are not any closer to finding true, satisfying fulfillment. For some, “having it all” has meant losing it all. The truth is, working mothers suffer. The children of working mothers always suffer. And should we forget—the husband suffers too. Severe fatigue plagues many working mothers. Balancing career, marriage and child care is an impossible task. Few can actually do it all. To do it all, corners have to be cut. Unfortunately, because of feminist peer pressure, marriage and family are sacrificed before career. Many two-career marriages have crumbled. Children have been left at home alone. Can we begin to see the harm that working motherhood has done to families? Our society of working mothers is a disaster. Experts agree that the industrial revolution produced families with absentee fathers. Now feminism has given us families with absentee mothers. What does this mean? Essentially, our children are growing up alone. It is estimated that as many as 60 percent of American children do not have full-time parental supervision. Think about it. If children are blessed enough to be in a two-parent home, generally they still have both parents working outside the home. The children are left home alone. If the family is run by a single parent, that parent (whether male or female) is working. Again, the children are home alone. This means our youth are growing up with an ever-dwindling amount of parental love, nurturing and supervision. The average latchkey child (a child returning home after school with no parent to greet him) is alone three hours per day. Some of these children are as young as 8; most are in their teens. When we think about parents arriving home after a difficult day at the office, we can logically surmise that there is not much quality time left for the child. All children and teens fundamentally need acceptance, praise, teaching and discipline. Children need to be taught right from wrong. Children need to learn how to be successful. This requires experience and activities. These needs are best met by parents. If these needs are not met at home, children have no other choice than to look elsewhere. This makes our children frustrated, angry and vulnerable to many dangers. Unfortunately, many children and teens are falling prey to unscrupulous adults and other youth who lead them in the wrong direction. For example, law enforcement officials recognize that gang membership is up. The sale of illegal drugs to elementary and middle school children is also escalating. One proverb states, “The rod and reproof give wisdom: but a child left to himself bringeth his mother to shame” (Proverbs 29:15). Many adults are shocked by headlines about school shootings and other youth crime, but is anybody doing anything about it? Experts are looking for causes and solutions. It is a proven fact that children and youth living under the loving attention of parents generally do not get involved with crime. Most experts now agree that to fix our social problems, the family has to be restored. But how? The solution to restoring families can only be found by understanding God’s intended purpose for men and women. Herbert Armstrong taught for many years that if you start from a wrong hypothesis, then the solution will be in error and the problem will grow worse. Isn’t that exactly what we are seeing today? When it was discovered that so many American women were unhappy, the women’s liberation movement assumed that the role of wife and mother was the cause of all the unhappiness; the solution to the problem was to have women reject the role of wife and mother. Did this solution produce the desired result? Today, many women admit they have not found true fulfillment in careers, and our social problems have increased. As Mr. Armstrong forewarned, the problem has grown worse. What is the cause of women’s unhappiness? We must look to the Bible for our answer. The cause for women’s unhappiness and frustration predates even the women’s suffrage movement of the 1900s. For millennia, women (and men) have not understood the God-intended purpose for women. Elizabeth Cady Stanton stated this about the Bible: “I know of no other books that so fully teach the subjection and degradation of women” (Eighty Years and More, 1898). I am sure many of today’s feminists would agree. But this comment reveals a total lack of understanding of a woman’s true purpose in life—of what true womanhood is and how to achieve it. In truth, the Bible’s purpose for women (and men), when fully understood, reveals a potential so incredible it is nearly unbelievable. Request your free copy of The Incredible Human Potential, by Herbert Armstrong, for an eye-opening explanation of God’s purpose for all mankind. A woman was not created to be a man’s slave, but his co-regent (Genesis 1:28). Neither could achieve success in life without the other. To be successful and happy in life, both would have to fulfill their respective created roles. Simply put, the man was to be a loving leader and provider; the woman was to help and inspire the man. She was also given the exalted responsibility to bear and train children. Men and women were created to work together to build a happy society that fosters growth and success. All this training on Earth was intended as a preparation for a future, more permanent afterlife. God intended that men and women share equally the opportunity to obtain eternal life (1 Peter 3:7). When men and women work together to achieve their designed purpose, they will experience satisfying fulfillment. So how do we restore families? What about putting fathers back in charge of families and having mothers stay at home? To many, this solution may seem oversimplified, yet it is the only solution that will work. As long as men and women forsake the position in life God intended for them, unhappiness, frustration and catastrophe will be the result. Our first parents, Adam and Eve, rejected what God taught them. They rejected their intended roles and they produced a child delinquent. Remember, Cain killed Abel (Genesis 4). Sounds thoroughly modern, doesn’t it? Will society fix our family problems? The answer is no. But if you seriously consider this article, you can change your family situation. The problems in our society and families go much deeper than feminism. What is the real problem? Feminism is a symptom of a deeper human sickness. After 40 years of history, it is clear now that feminism’s agenda has always been to seize power and change society to suit its own purpose. Feminists have been selfish and self-centered. Little thought has been given to the impact on others. Many now recognize that feminists have grown excessively selfish. The movement is now best defined, not as we, but me! The current trends in feminism are a sign of our times. It is typical of a human problem that has existed since Adam and Eve: Men, women and children have all become extremely selfish. The Apostle Paul prophesied this sickness in our society nearly 2,000 years ago. He wrote to Timothy, “This know also, that in the last days perilous times shall come. For men [and women and children] shall be lovers of their own selves, covetous, boasters, proud, blasphemers, disobedient to parents, unthankful, unholy, without natural affection, trucebreakers, false accusers, incontinent, fierce, despisers of those that are good, traitors, heady, highminded, lovers of pleasures more than lovers of God; Having a form of godliness, but denying the power thereof: from such turn away” (2 Timothy 3:1-5). If we are truly honest with ourselves, we can easily recognize that this scripture perfectly describes our time. We live in dangerous times. Why? Remember, there is a cause for every effect. As Mr. Armstrong said so many times, all human beings are living the way of get! Everyone selfishly seeks only what he perceives as good for himself. What are the results? Isaiah gives us the answer. Referring to our time, he wrote, “And the people shall be oppressed, every one by another, and every one by his neighbour: the child shall behave himself proudly against the ancient, and the base against the honourable” (Isaiah 3:5). When human beings live only for self, everyone eventually suffers. The Bible shows us that the worst time of human suffering is just ahead of us (Matthew 24:15-21). Mankind—which includes men, women and children—is bringing this suffering upon itself. But there is hope. Although the Bible shows us there are some very serious times just ahead, afterward there will be the best of times. Jesus Christ will return. He will restore the family. Women’s high calling as wife and mother will be reestablished. Fathers will be taught how to lovingly guide their families. Peace, success and abundance will break out worldwide.